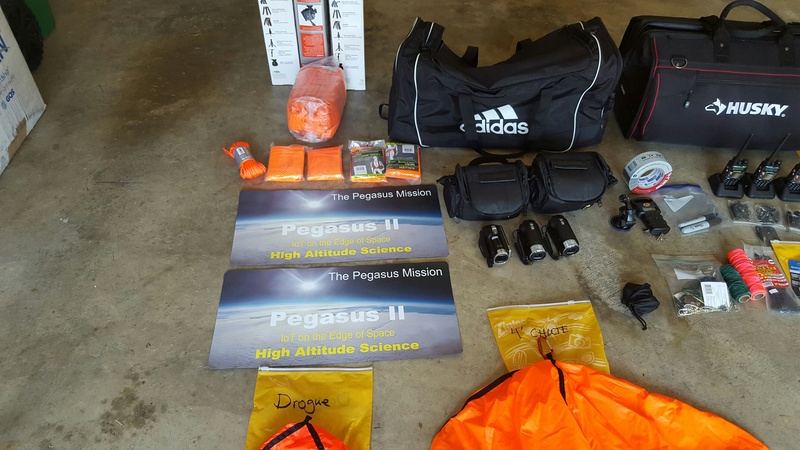 Pegasus II is GO for LAUNCH from Cheyenne, WY at ~9AM Mountain Time, Tues Oct 6 2015. We will have to work quickly to beat the weather. Hopefully, to be operational by 9AM MDT. Pegasus experienced a delay, then cancellation of flight for Oct 5 due to a mechanical failure in the Delivery System Release (DSR) servo. The cancellation was necessary because of the failure of the servo and the time needed to obtain and test new equipment. High altitude is inherently a risky business and mission commanders will not put the craft at unnecessary risk to make dates, thus cancellation of the Oct 5 flight was required. We have a 2 day window to make flight and will try for a 9AM (Mountain Time) lift off for Pegasus II, Oct 6, 2015. Weather conditions are not optimal with scattered thunderstorms rolling through the area. However, we believe a window exists between 9AM-11AM for the team to make a safe flight and conduct recovery operations near Cheyenne, WY. We will try to make flight on Oct 6. However, if thunderstorms exist between 7:30 and 9AM tomorrow, Oct 6, at the launch site, the mission will be scrubbed and force a multi-week delay in flight and possibly a new launch location. We will try and hope the weather holds for flight. Below is the projected flight path. Android and Windows mobile apps now ready for flight. Please make sure that you update these apps if you have already downloaded and installed. Search for “Pegasus Mission” in the app/play store. We are pushing to get the iOS/iPhone ready by flight time, but this may be close. 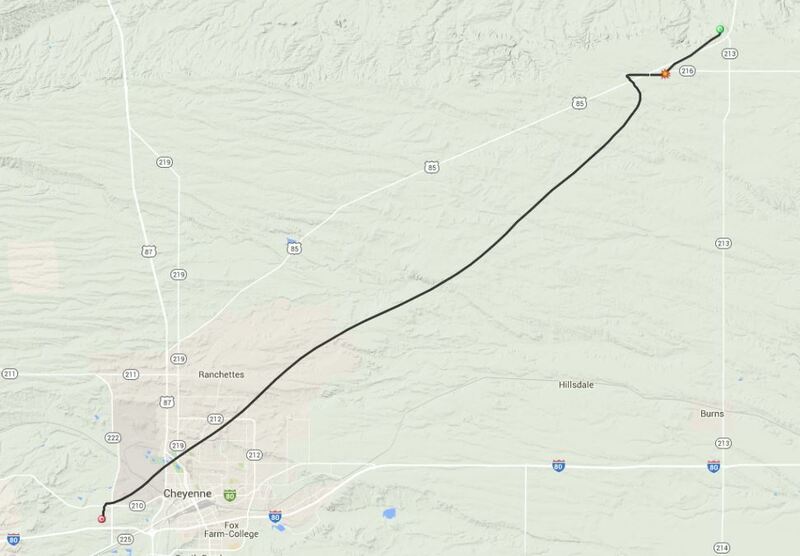 Flight 10:00AM Oct 5 2015 from Cheyenne, WY. 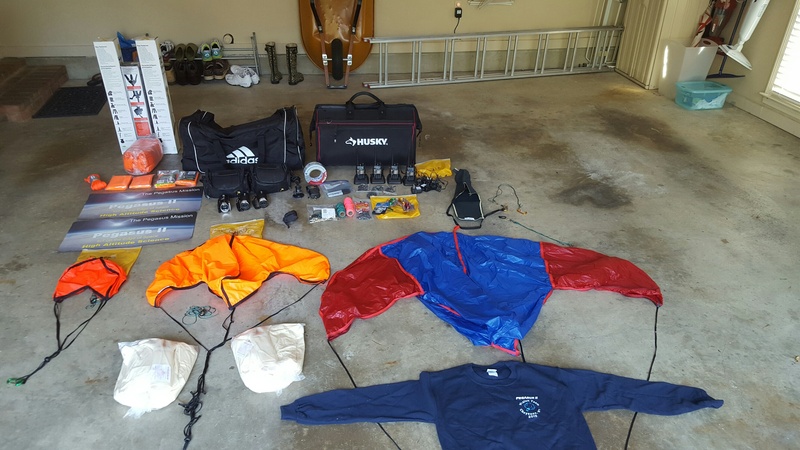 Packing up just my gear for Pegasus II. 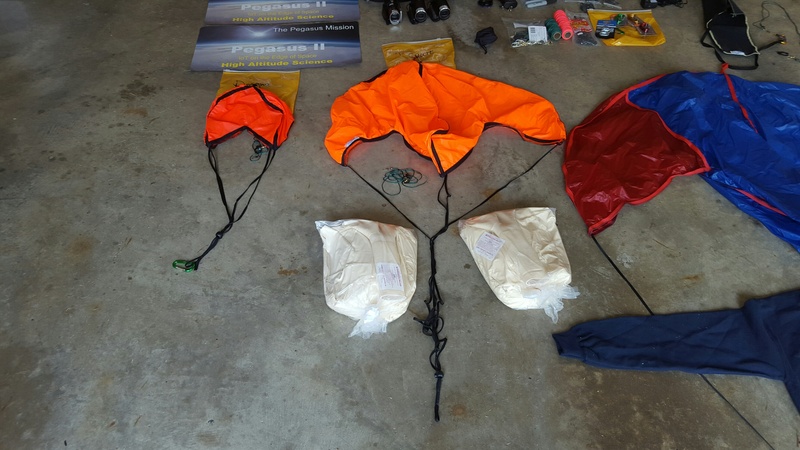 Parachutes, 2-way radios, video, and other odds and ends. 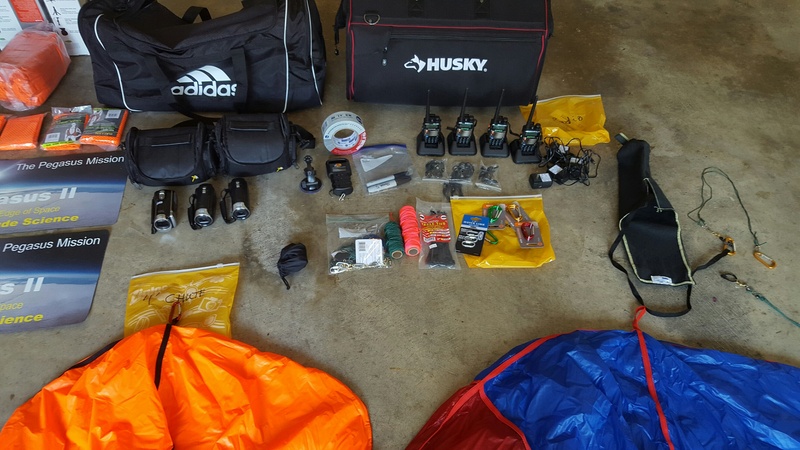 Mark has the devices, ground stations, and payload with him. We will meet in Denver tomorrow and drive up to Cheyenne, WY and pick up 291 cubic feet of Helium before 5pm. We will spend the next 2 days prepping for flight and a little practice time to get the mission off close to schedule. Much work to do this weekend. 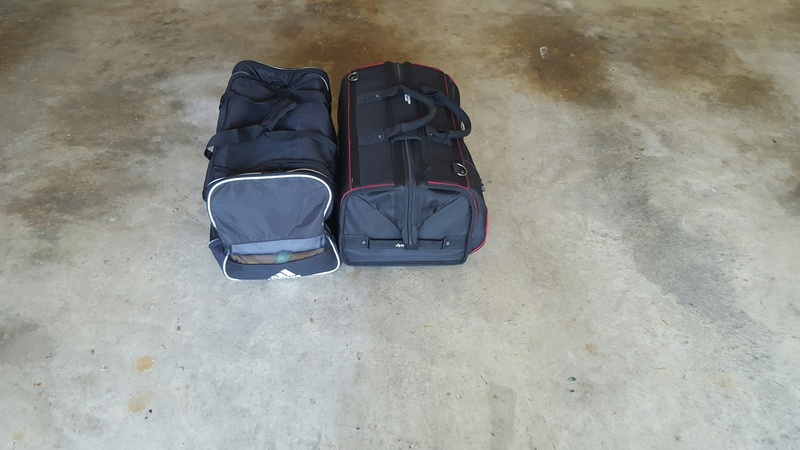 Below is what I am packing minus computer and other assorted tech toys. You will notice 3 parachutes. 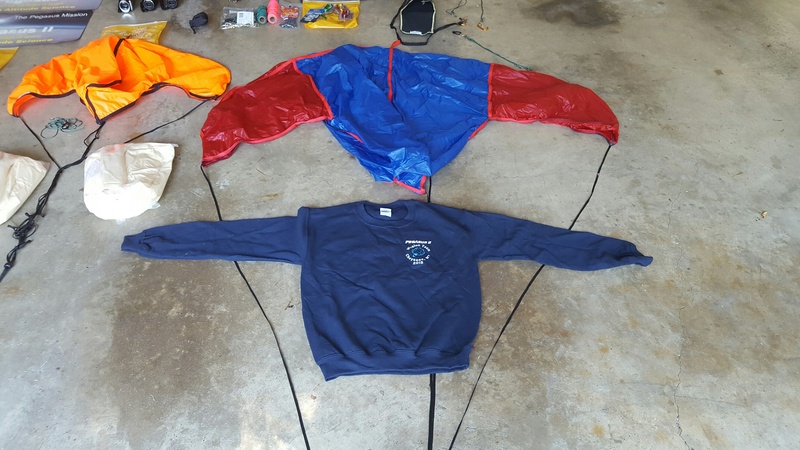 The 4′ parachute hopefully is disposable as it is a backup system for premature balloon burst. We should come down on the 2′ parachute for 88,000 feet hitting close to 300 mph, then deploy the main 7′ parachute at 12, 000 feet and 2 minutes prior to impact. If all goes well the flight operations will be control be remote intelligence running in a Microsoft Azure data center 1,000 miles away from the craft. Flight is scheduled for Monday Oct 5th 2015 at @10AM. Please sign up for SMS Flight Notifications and the craft can text your phone when it launches.